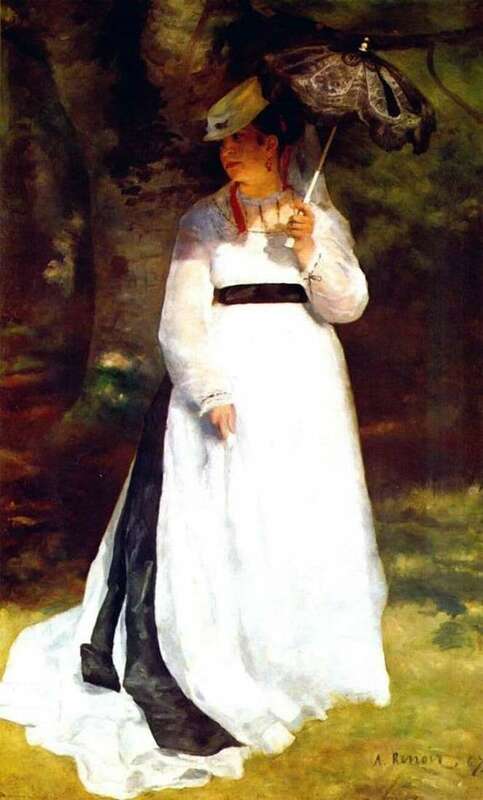 The painting “Lisa with an umbrella” is one of the most lively and voluminous works of the author. The play of light and darkness on the canvas gives the composition a greater volume and expression, which is why the work of art draws the eye to itself. The main figure of the canvas is Liza Treo – the girl whom the artist dearly loved. Lisa had a relationship with the artist for a long time, but over time the couple decided to break them. This was a blow to Liza, but a few years later, her life went smoothly: the girl played a wedding with the architect, and forgot about her broken heart. The girl is depicted in full growth in a beautiful white dress with a black ribbon tied at the chest. The ends of the ribbon along with the hem of the dress are quite long. The abundance of white color is associated with the purity, ease and tenderness that the author felt for his beloved. The left hand of the girl clamps an umbrella that protects the heroine from sunlight. A dark umbrella with a lace pattern creates a contrast of the pattern along with a black belt. This technique gives the image of richness and harmony. Liza’s head is tilted to the right, a beautiful face expresses kindness, and the mouth is curved in a faint smile. The girl’s dark hair is barely visible from under the blonde hat, and behind her the head of hair is gathered with a scarlet ribbon running down her shoulders. The background consists of highlights, alternating a wide variety of colors. Thus, it seems that the light itself, drawing the ornate patterns and contours of a wide variety of shades, served as the drawing material for the artist. Based on the outlines of the background behind the girl, it becomes clear that she is in an open space, such as a garden, forest or glade. The canvas was painted clearer, brighter and more alive, probably due to the fact that at the time of painting the artist tried to convey as realistically and accurately as possible the feelings that Lisa Treo has.